Consumers may be avoiding ads on TV, but they’re watching and sharing video ads online more than ever before according to new research. Data released by social video measurement firm Visible Measures, shows that views of social video ads served to English-speaking audiences increased to almost 1.33 billion in quarter one of this year, a 78% rise over Q4 2011. While quarter one has historically been a big quarter for online video ads, due primarily to the Super Bowl, the significant increase in views this quarter compared to previous years illustrates just how fast social video is growing, the report says. 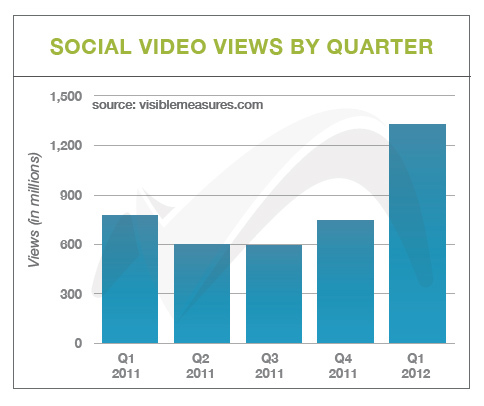 The research analyses data from social video ads served on Visible Measures’ network to an English-speaking audience. It also looked at the top creative approaches of quarter one, finding that humour yielded the greatest results, with videos fitting this category grossing around 490 million views. Celebrities and icons ranked second with 326 million views, followed by community and activism with 227 million, animation with 181 million and product demonstrations with 138 million views. The top campaigns for quarter one 2012 were Invisible Chicken’s ‘Kony 2012’, M&M’s ‘Just My Shell’, Volkswagen’s ‘The Dog Strikes Back’, Rovio’s ‘Angry Birds Space’ and Honda’s ‘Matthew’s Day Off’.